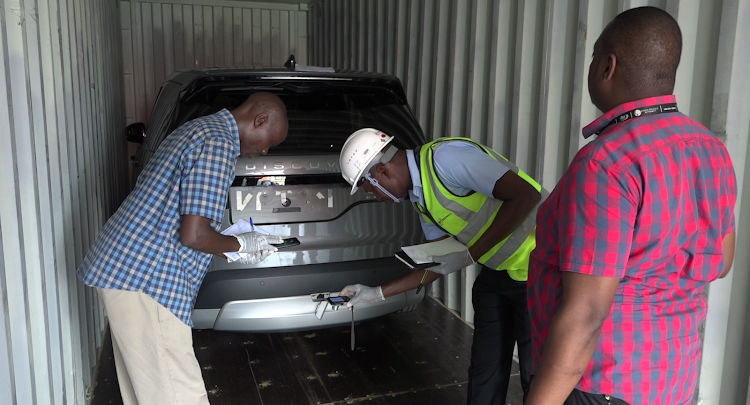 Kenya Revenue Authority (KRA) has intercepted two concealed high-end vehicles, a Range Rover sport and a BMW x5, imported through the port of Mombasa which are believed to have been stolen from the United Kingdom. The vehicles arrived at the port of Mombasa in a 40-foot container on 19th February this year, abroad MV. Maersk Brooklyn, from United Kingdom. On 27th February, KRA customs officers received intelligence reports that the container had suspected stolen motor vehicles. KRA then requested Kenya Ports Authority (KPA) to place the two containers on hold and subject them to scanning and verification at the Customs Warehouse. Imported documents indicated that the container was carrying one Mercedes Benz A180 and a BMW 1251 sport and when the container was scanned on 28th March this year, images revealed the shapes of the two high end vehicles. Upon 100 per cent verification by a Multi-Agency Team on Wednesday, the container was found with one unit used Range Rover Sport HSE SDV6 and one unit used BMW X5. The vehicles declared in the manifest and bill of lading were not found in the container. Manifest reveals that the exporter was Kola Solomon from London, UK and the Consignee was listed as Namanya Alex of Kampala, Uganda.